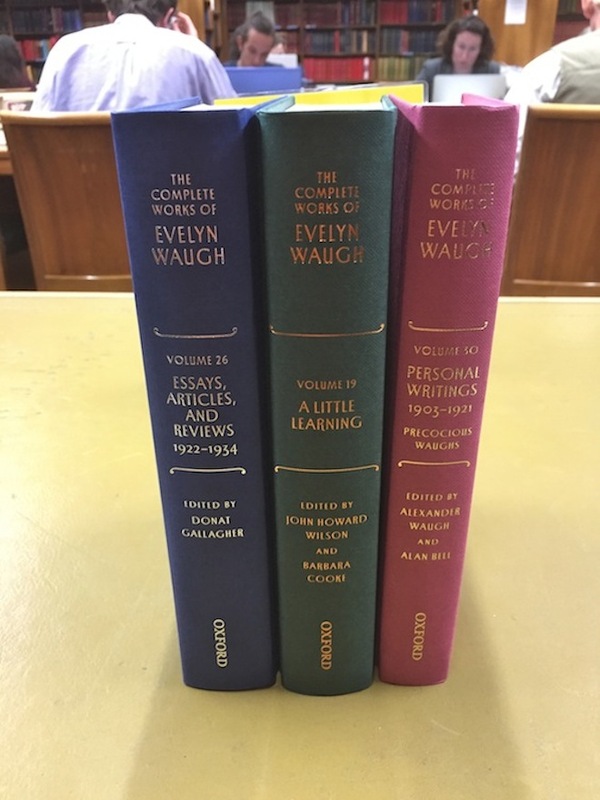 Five volumes of The Complete Works of Evelyn Waugh were published in 2017. As it's approaching the end of 2018, it's high time I took a first look at them. Only three books, the astute browser will notice. That's because I intend to focus on Rossetti, edited by Michael Brennan, on another occasion. And the Vile Bodies volume, edited by Martin Stannard, is not held here, which is something I'll come back to before the end of this piece. Anyway, three volumes of Wavian scholarship (aka Waughmania) is more than enough to be going on with, surely. Of course, the beginnings of all the books are the same. First, a list of the 43 volumes. Divided into fifteen works of fiction, four biographies, five volumes of travel writing, four volumes of Essays, Articles and Reviews, twelve volumes of Personal Writings (that's to say letters and diaries) and two other volumes. CWEW, Volume 26, Essays, Articles and Reviews 1922-34. Sample page. A word on the colour-coding. I know from their Amazon listings that Vile Bodies and Rossetti are also bound in green cloth. So I think that all the individual books, whether novels, biographies or travel will be between green covers. The Essays, Articles and Reviews is one long effort usefully divided into four rough decades, each bound in blue. And the Personal Writings also are one life-long effort, as it were, pragmatically divided into twelve volumes of luscious pink. Alas, right now and for the foreseeable future I do not have £3,000 to spare. But I do have a BUS PASS and a LIBRARY CARD. And with these in my wallet I have travelled today to the NLS in Edinburgh to view three CWEW volumes at a total cost of nil pounds. Next (in all three of the books) comes a statement by the man at the top of the Waugh tree as it currently stands. That's Alexander Waugh. You must buy any one of the CWEW volumes to read his words of wisdom, or get yourself to a suitable library. But the short statement ends by saying that the edition is dedicated to the ever-living memory of the author and his work. 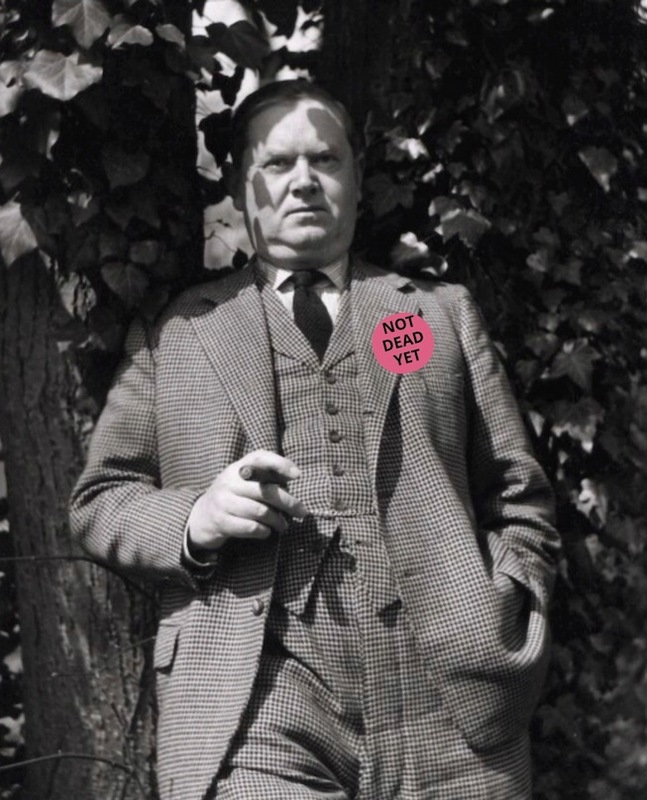 Which is another way of saying that Evelyn Waugh is not dead yet. Back to the list of books page. Also at the top of that, you can see that the Executive Editors are named as Martin Stannard and David Bradshaw. Their statement of Editorial Principles covers two pages and is initialled by both, though the latter sadly died in 2016. This has been a long project in the making and several of the editors have expired under the Waugh yoke. So what are the editorial principles? I think these will have to wait for another day. Besides, these would only apply to the green book that's to hand. That's to say A Little Learning. But it's the blue book I want to start with. For does it not glisten with silver gilt? After Waugh left Oxford, he published next to nothing in terms of essays, articles and reviews until the success of Vile Bodies. After that, opportunities to publish in papers poured in, as can be understood by perusal of the second and third contents' pages. Most of the pieces were written because Waugh needed the money. 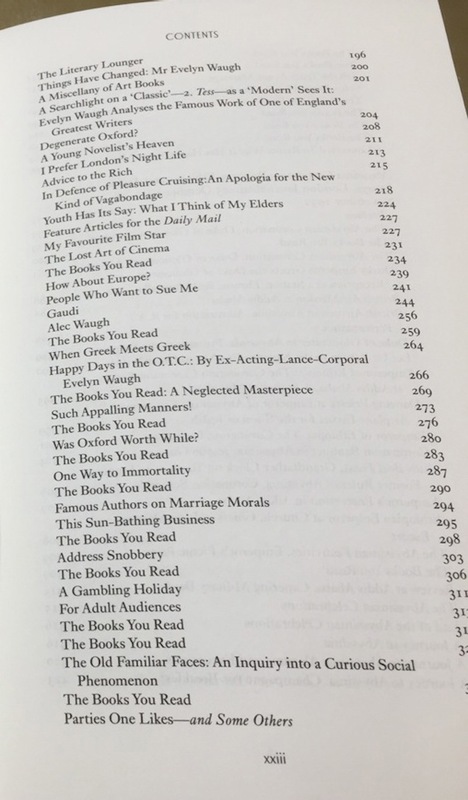 But the book review headed 'The Books You Read - A Neglected Masterpiece' on page 269, refers to Living by Henry Greene. Evelyn had admired that book since June 1929 and in 1930 did what he could to help its reputation. The third section of CWEW - EAR begins in October 1930, when Waugh went to Abyssinia on behalf of both the Daily Express and The Times to cover the coronation of Hailie Selassie. 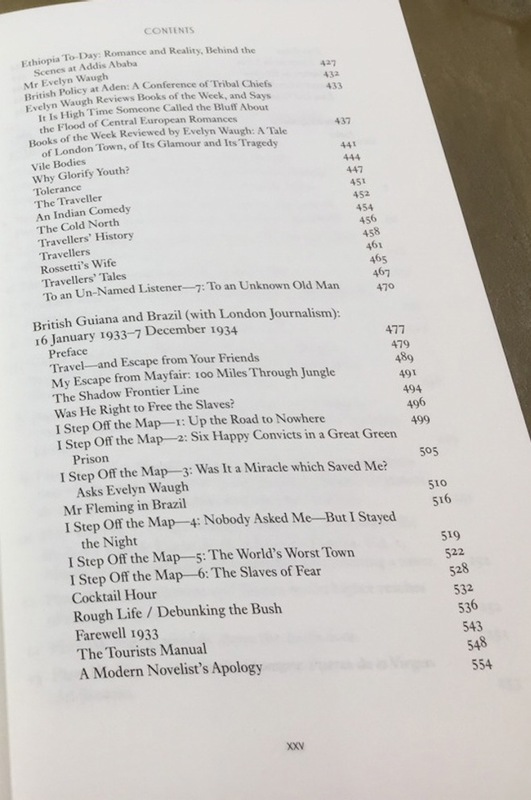 Just looking down the list of titles makes me want to read these pieces and to put together the process by which Waugh moved from them, to a travel book (Remote People), to a novel (Black Mischief). Waugh's pieces settled down to consist of a stream of book reviews until he took himself abroad again, this time to South America. The six pieces called 'I Step Off the Map' were written for a weekly called The Passing Show. Donat Gallagher tells us that these Passing Show pieces - and indeed much of Waugh's travel journalism - were not much good. Waugh was not at his best coming to terms with new places. He had to fully integrate himself with a new experience before he could write really interestingly about it. Facile, EW was not. Anyway, that's just about it for volume one in the time available to me today. The acknowledgements page is a generous one. Donat, who is getting on a bit, makes it clear how much he has been helped by his wife and collaborator, Mary Gallagher. He warmly acknowledges many others as well, including the late David Bradshaw and the late John Howard Wilson. Gallagher's acknowledgement of the Daily Express, Daily Mail and Times archives makes me realise the likely reason why this book costs more than the others. No doubt these journals have had to be paid reproduction fees. Poetic justice, given the high fees Evelyn Waugh got for them in the first place, with the help of his agent. 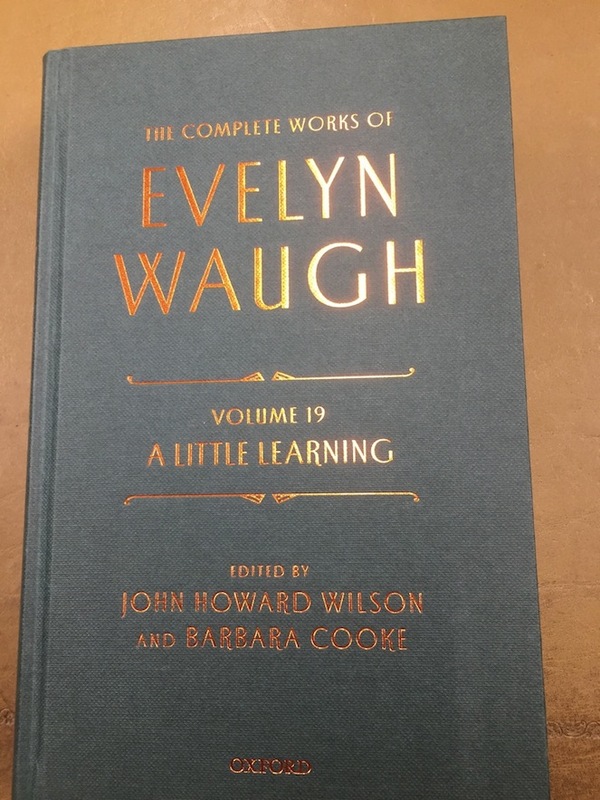 Quite often in Waugh's career, Peters had to apologise to editors for the fact that his client's work 'wasn't up to its usual high standard' while pocketing on Evelyn's behalf the whopping fee agreed in advance. Though Gallagher also makes it clear that EW often wrote seriously for nothing, for The Tablet, a Roman Catholic paper, and other causes that Waugh deemed good. OK, let me put that book to one side. Though by hook or by crook I'll be forking out for it sooner or later. There is just too much primary source material that has not been sufficiently mined yet for me to ignore it for long. I am all too aware that Alan Bell has died. 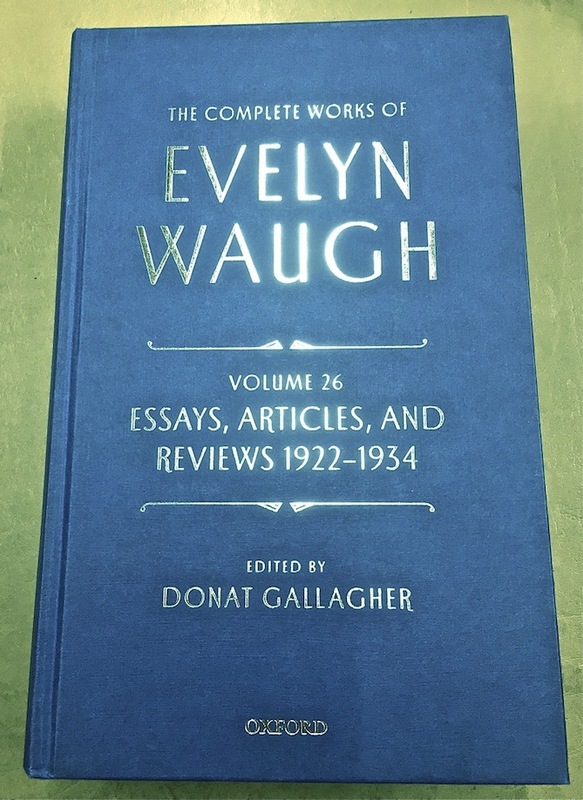 In June of this year, in connection with an essay I'd newly posted on this site concerning EW and Gertrude Stein, I sent out an email to him and a few other Waugh scholars, addressing each of them as a 'Top 100 Evelyn Waugh Reader'. Olivia Bell responded immediately, asking me to take Alan off my mailing list as he'd died in April. Which of course I did, apologising for my ignorance. Alexander Waugh details Alan Bell's contribution to the project in his introduction, which brims with interesting perspectives. Such as when extracts of his grandfather's diaries appeared in The Observer in 1973, the eight-week serialisation was at the time that paper's biggest ever. These PW volumes contain the letters and diaries, many of the letters in particular not having been published before. They are going to be essential reading for me in years to come. However, this first volume is of special interest as it concerns Waugh's writings when he was a child and teenager. The diary that he kept while at Lancing was largely reproduced in The Diaries of Evelyn Waugh, published in 1976. But the revelation in this CWEW volume is the richness of the boyhood diaries pre-Lancing. 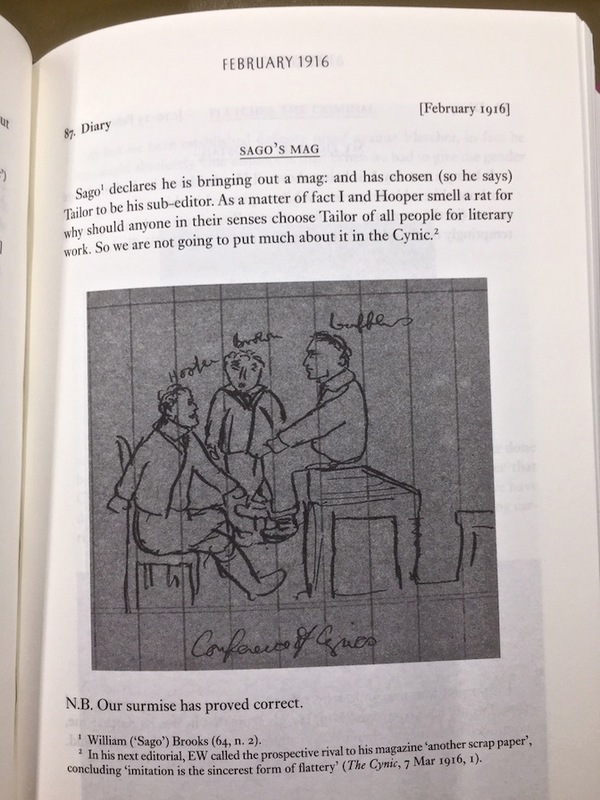 Most of the pages include lively drawings and derision directed at unpopular teachers and fellow pupils. CWEW, Volume 30,Personal Writings 1903-21. Sample page. Why Wuffles? I suppose that started with the difficulty of pronouncing Waugh. Woff? Wuff? And ended by trying to make a parallel with Raffles. It cannot be emphasised enough just how free-flowing and confident both the sketches (on just about every page) and the prose are. Oh yes, he loved a fight did Evelyn. And he loved expressing his love of fighting. Did you notice this sentence on the first of those three pages reproduced. 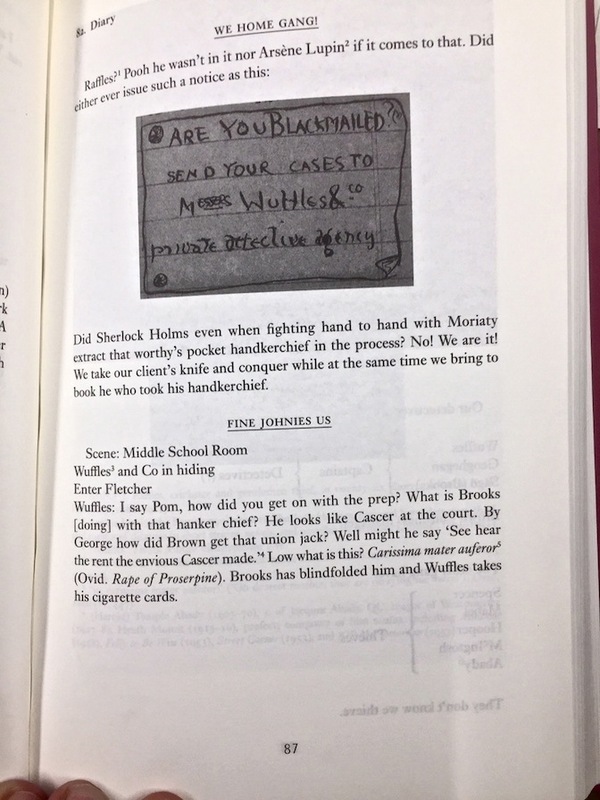 'We take our client's knife and conquer while at the same time we bring to book he who stole his handkerchief'. Dare I say that young Evelyn meant simply: 'We take our client's knife and bring to book he who stole his handkerchief'. I couldn't resist taking that opportunity to correct the 12-year-old Waugh's prose. There were few opportunities to do so once he grew up. Again this is a volume I am going to have to buy at some stage. As well as all subsequent pink volumes of Personal Writings. But for now let's pass onto the third of three volumes at my disposal in the NLS. From summer 2012 to late 2014, John was also regularly writing to me about my essays and about the CWEW editing process, which he found cumbersome and knew would give rise to deadlines being missed. He gave me privileged insight into the relationship between the projects principle editors and tensions between the American and English factions, which I'm far too tactful to repeat here. CWEW, Volume 19, A Little Learning. Sample page. It follows the format laid down at the front of the volume by Martin Stannard and David Bradshaw. However, I won't go into all that 'The Text in History' and ''The History of the Text' stuff on this occasion. I'll wait until I properly engage with A Little Learning, which will no doubt be when I finally get to the Combe Florey section of this site. Here is a photo of John that I think does him proud as well, taken at the gatehouse of the aforementioned Combe Florey, Evelyn's final home. 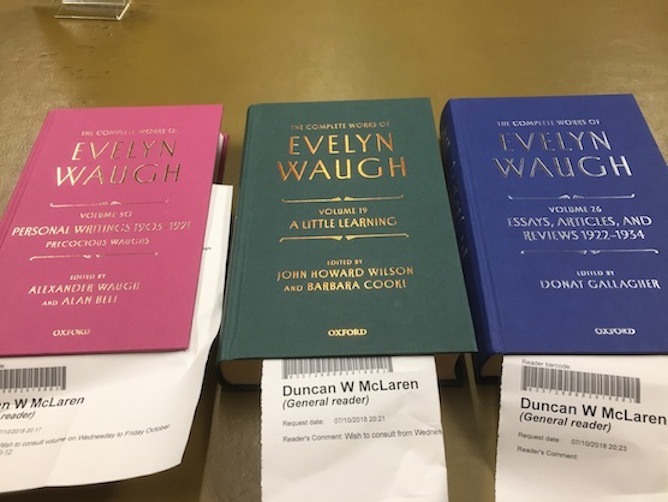 I've marked Alexander Waugh, JHW and Donat Gallagher via a colour-coding system that is obvious. 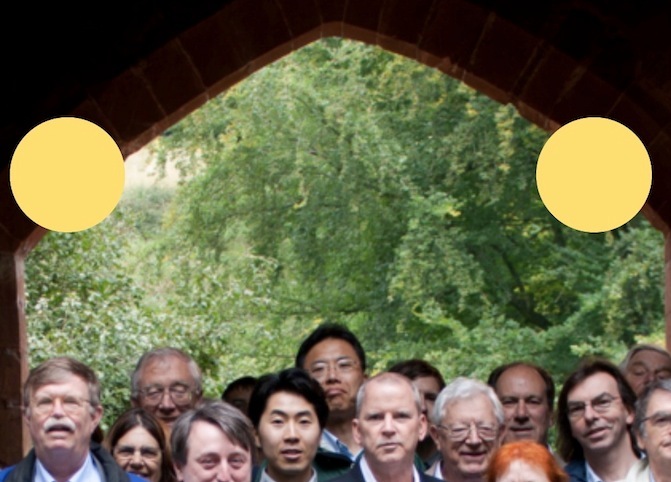 The photo was taken at the three-day Evelyn Waugh Conference, 2011, the only time I met John in person, though a hundred emails must also count for something. Credit for photo awaited. It may be Antony Vickery. CWEW, Volume 2, Vile Bodies. Sample footnote. It's Jeff who updates, on a more or less daily basis, the news page on the EW Society site. As such, he publishes more comment, nostalgia and analysis about the author than anyone else (except, just possibly, me). The death has been announced of Professor David Bradshaw of Worcester College, University of Oxford. He was Professor of English Literature and author of The Hidden Huxley (1994). He edited and wrote the introduction to several novels, including the Penguin Modern Classics 2001 edition of Waugh’s first novel Decline and Fall. 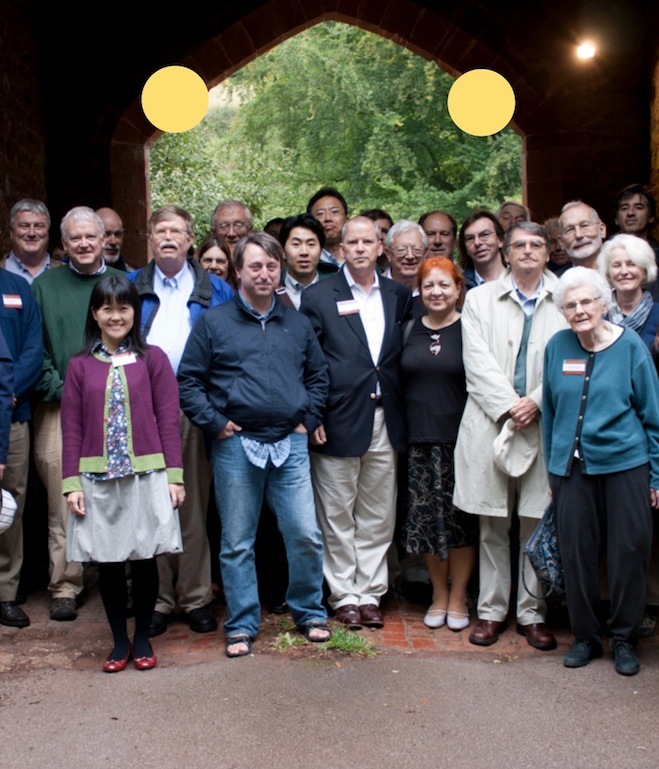 Professor Bradshaw was also Co-Investigator with Professor Martin Stannard of the Complete Works of Evelyn Waugh project at University of Leicester. Memoirs by other members of the CWEW project may be seen at this link. The link takes the reader to warm notices by Barbara Cooke and Martin Stannard. a distinguished career in collection development that began on graduation from Selwyn College, Cambridge with his appointment as Assistant Registrar to the Royal Commission on Historical Manuscripts, and included fifteen years as Assistant Keeper at the National Library of Scotland (1966–81) and twelve years as Librarian at the University of Oxford Rhodes House Library (1981–93). Needless to say, Jeff Manley doesn't just write death notices. 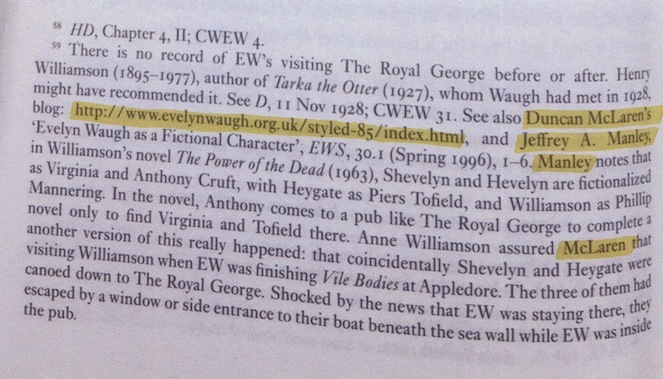 If someone has an opinion about Evelyn Waugh, whether on TV, radio, in magazines or on the web, Jeff is onto it. He reports it, often adding his own spin, though always in a restrained, knowledgeable, reader-friendly and wise way. 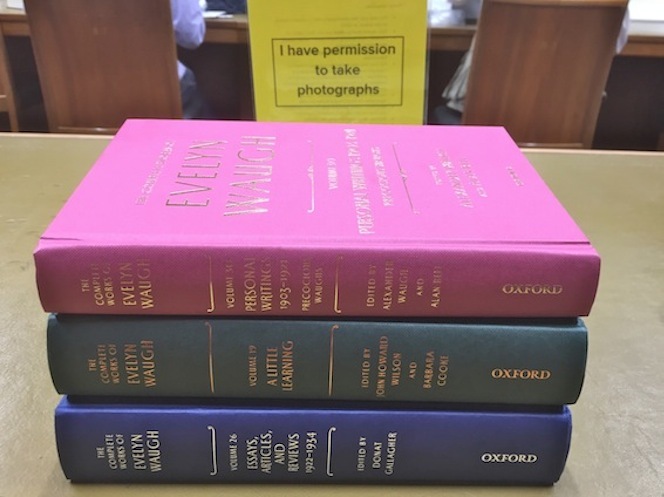 The Oxford University Press commissioned a review of three early volumes of the Complete Works of Evelyn Waugh from its sister publication Essays in Criticism. A review of these volumes (Vile Bodies, Precocious Waughs, and Rossetti) has been ably written by Lisa Mullen of Worcester College, Oxford. Her review (entitled “And Who is Not Amused?”) takes up seven pages of the current issue (v. 68, no. 4, October 2018). The review begins with the observation that in these early works, rather than expressing the conservative views with which he is so often associated, Waugh “seems tempted by revolution or at least the idea that his generation ought to break new ground […] These volumes reveal different aspects of Waugh’s youthful plasticity and show how his adult persona developed as he tested himself as a writer.” After explaining the mechanics of the Complete Works project, Dr Mullen examines Precocious Waughs and finds in the childish drawings it copiously reproduces one of that volume’s “greatest pleasures.” In the early diaries she discerns a reflection of Waugh’s “harsh self-assessment” of his somewhat exhuberant childish nature. In her review of Rossetti, Dr Mullen notes with approval Michael Brennan’s assessment that Waugh was in this book “rehearsing profound questions about art, aesthetics and morality” that he would return to at greater length in his later books. His approach to Rossetti’s life is compared to the “insubordinate” biographical method of Lytton Strachey then in fashion. 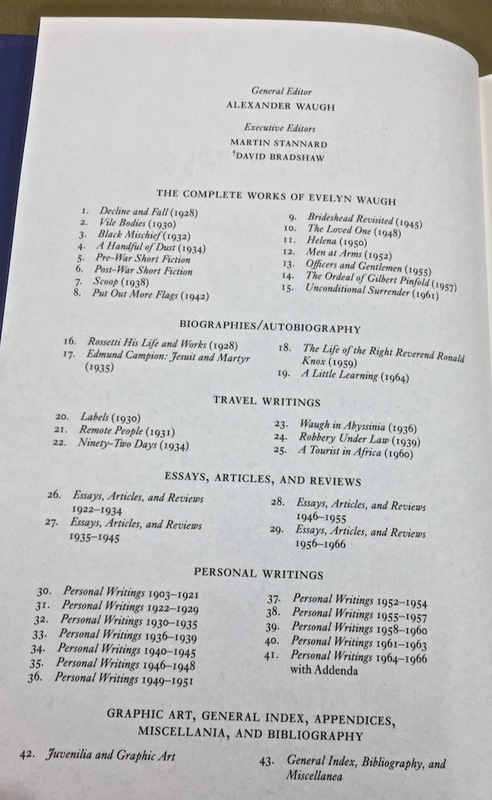 She sees in “Waugh’s recoil from ugliness the path that will lead him to Catholicism.” She also praises Brennan’s introduction for its description of the circumstances affecting Waugh’s life when he wrote the book. 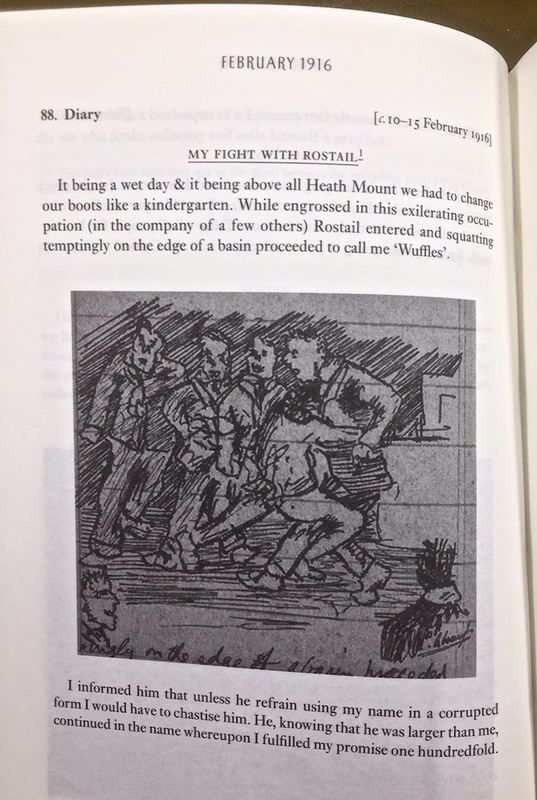 “As sometimes walking in the middle of London one has a sudden impulse to run”, he writes, “I feel I must write prose or burst.” Unwittingly, he was summing up the very quality of creative energy which pulses unmistakably within these volumes – and stands as Waugh’s lasting retort to his father’s appeal to dullness. Oddly, after taking the time, trouble and expense of securing this thoughtful and detailed review, the copy posted on the internet by Essays in Criticism (which is also published by OUP) has been put behind a paywall. It may make sense to encourage subscriptions by limiting the internet availability of essays and articles, but reviews are intended in major part to help readers decide whether or not to buy a book. OUP won’t shift many copies with a paywalled review. 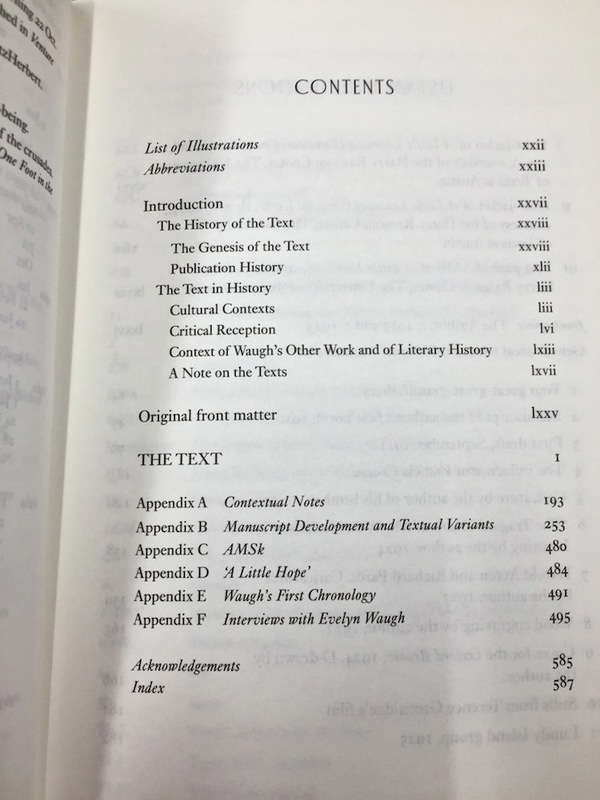 Meanwhile, your correspondent has been advised by a reader in the UK that the copies of the Complete Works thus far published are not available consistently in all of the UK’s depository libraries. For instance, the National Library of Scotland in Edinburgh lacked the Vile Bodies volume. The only deposit libraries with all five volumes are the British Library and the Bodleian. The other three deposit libraries that are entitled to them (Cambridge University Library, National Library of Wales, and Trinity College, Dublin) have either no copies or incomplete sets. Under the applicable statutes, only the BL receives copies automatically. The others must request copies and the publisher is obliged to provide them at no charge. 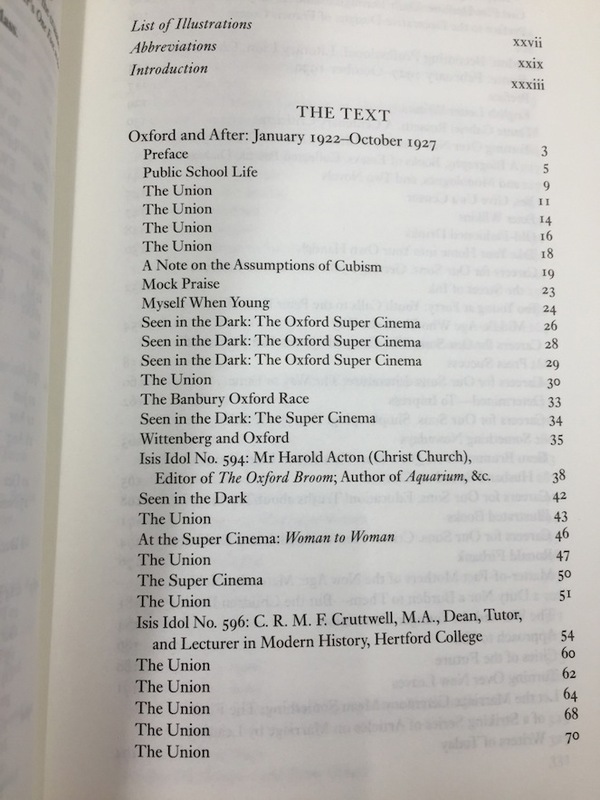 Readers living near these other libraries might want to suggest to them that they should seek copies of all volumes from OUP as they are printed. The UK reader to whom America-based Jeff refers to is me. I like to keep Jeff informed of what's happening in my part of Waugh's world. And he obliges by doing much the same in return, though taking a wider and less subjective view. “You've had a pleasant run! That is only a bit of fun, for goodness sake! We're all in this together. 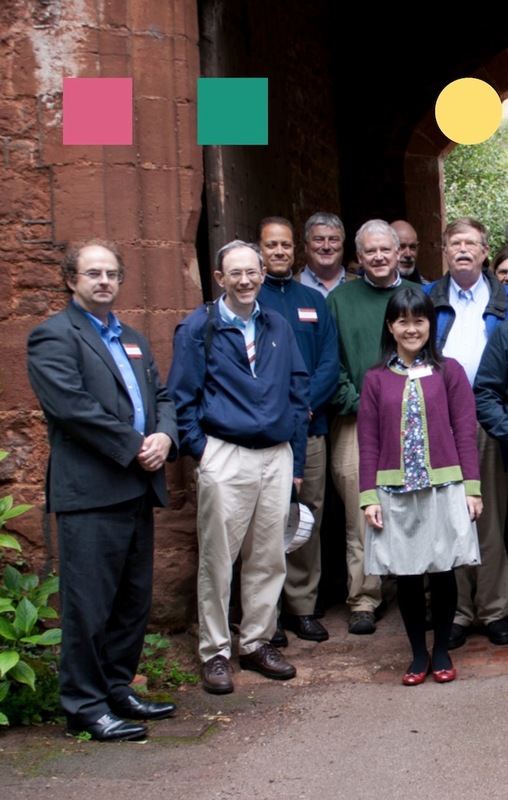 And just to prove it, here is the group four years later, at Leicester rather than Combe Florey. And as you can see all the scholars are still there. Well, no, John Howard Wilson is not there, God rest his generous soul. Barbara Cooke has taken his place, as it were, and made a superb job of it. Martin Stannard too is there, a family commitment having kept him away from the 2011 conference, if I remember rightly. And Michael Brennan, whose Rossetti is admired in the review quoted above. 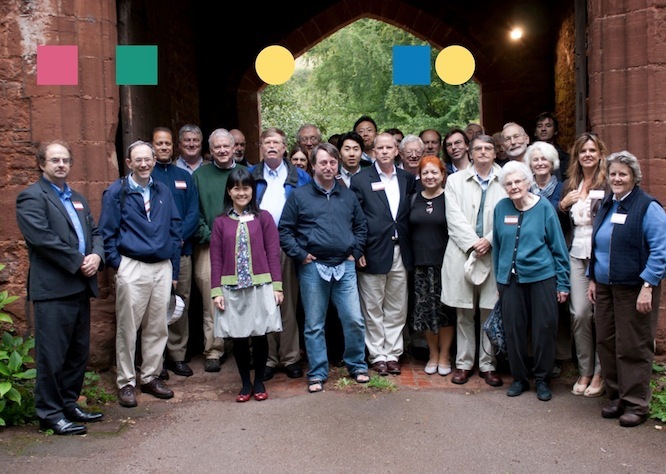 Individuals who are in both the 2011 and 2015 pictures include Paula Byrne, Peter Dewey, Robert Murray Davis, Marcel DeCoste, Tony Vickery, Ann Pasternak Slater and Patrick Query. Apologies to anyone I've missed, but if you let me know I'd very much like to add people to the list. 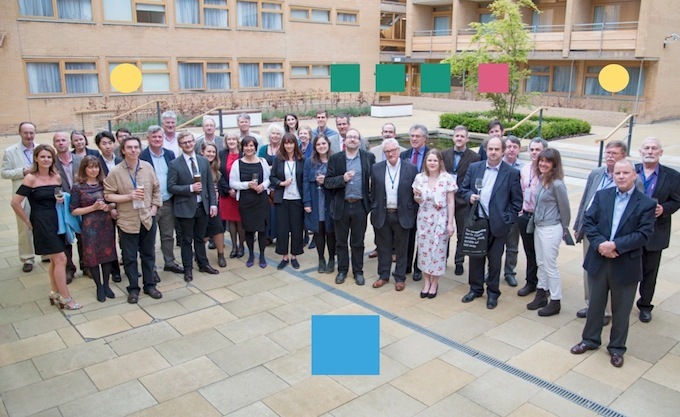 David Lodge is in the 2011 picture only, and Selina Hastings in the 2015 one. 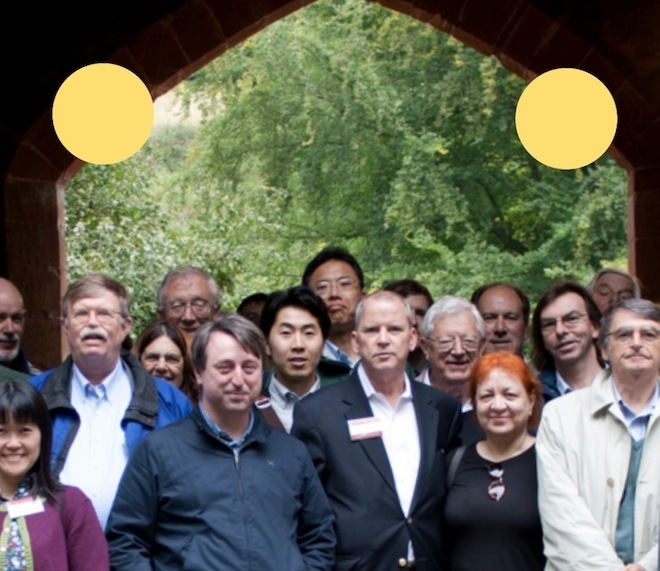 And many other distinguished individuals are in one or other of the photos. The 2015 conference was more business-like than the 2011 one. Its main purpose was to get editors together to discuss their work-in-progress, via lectures, workshops and informal discussion. It cannot be over-emphasised just how much work from at least two generations of Waugh scholars has gone into CWEW. 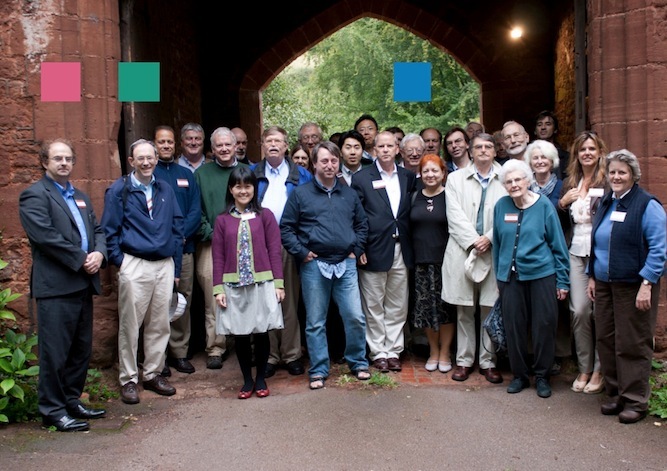 Donat and Mary Gallagher were at the 2015 conference but I don't see them in the picture. Perhaps they returned to Australia before it was taken. An opportunity, then, for me to foreground their achievement. I hope the symbol seems fitting. It was at the 2015 conference that I spoke briefly to Martin, and he said he'd cite my website in VB. I hope he's done it more than once, but it doesn't really matter. The first cite is the deepest. It was at dinner one night, that Alexander Waugh took spoon to glass and pinged our attention. He said a few words in tribute to John Howard Wilson. Quite a funny story, actually. I'll take this opportunity four years down the line to say a few words of my own. I've finally finished reading your book, and I think it's perfectly BRILLIANT! I'm quite serious. I very much like how you revisit the places where Waugh lived and combine the descriptions with summaries of the books, research and fantasies. I'm sure some people will say that there is too much of you, but you are funny, and that's a large part of the book's pleasure: not just rehashing all those old novels (which we do in academia), but discovering new things about them and trying to explain them to others. Also, you show how funny Waugh's writing is by adopting and using many of his phrases, often in surprising ways. I also think you build a very complicated reading of his early career, with the influences all the way back to Hampstead. Congratulations, and best of luck with placing the book. I think it's one of the best ever written about Waugh, at the heart of him, as he said about Forest Lawn. Hope you've got a contract by now. I weep for you, John, four-years gone. I deeply sympathise. Holding my pocket handkerchief before my streaming eyes. But would Wuffles approve of what I've just written? How did the 12-year-old put it again? 'We take our client's knife and conquer while at the same time we bring to book he who stole his handkerchief'. I should have known Evelyn didn't get it wrong! He was describing how to set about an oyster. With gusto. A skill that lasted all life long. 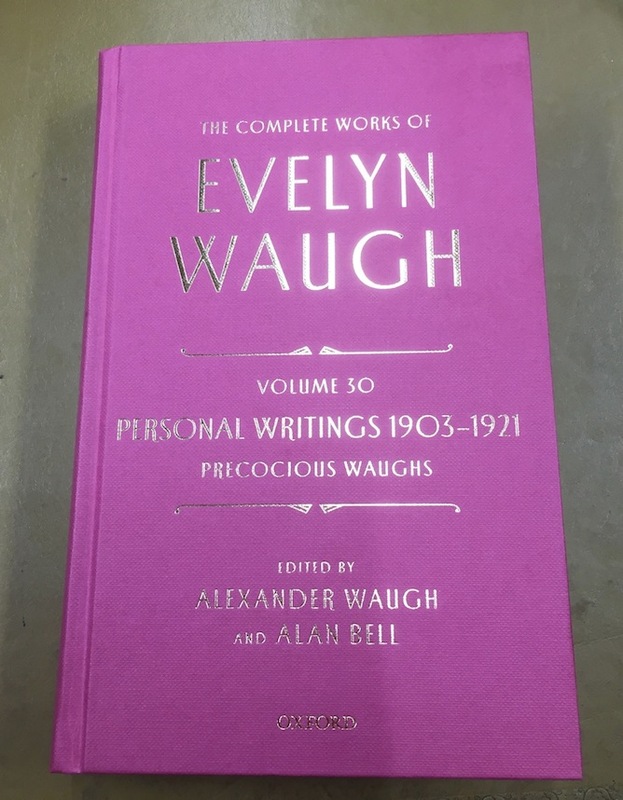 Evelyn Waugh's skill-set. There for all to see for centuries to come, courtesy of CWEW editors. Plus hangers-on. Oh God, I called him Wuffles a minute ago. Am I going to get away with using his name in a corrupted form? Evelyn Waugh by Cecil Beaton, bromide print on white card mount, April 1955. Reproduced - and badge added - with the forbearance, I hope, of the copyright holder. Seems like I'm fine. Evelyn is nursing a Beaton-induced hangover and can't be bothered to chastise me. He warns that if Cecil or I do it again he will fulfil our fears one hundredfold. 8 Feb 2019. Stephen Meachen has written to suggest that Waugh has mis-spelt 'conker' as 'conquer'. So young Evelyn took his client's knife and conker. The joke being that the client was being relieved - by private detective 'Wuffles' - of things more precious than the mere handkerchief stolen by the original thief. Nice one, Stephen. Nice one, Evelyn.